Here, we provide the first extensive examination of the community composition of this cosmopolitan phylum in a range of pelagic habitats (176 datasets) and highlight the impact of salinity and depth on their phylogenomic composition. Reconstructed genomes (53 in total) provide a perspective on the phylogeny, metabolism, and distribution of three novel classes and two family-level taxa within the phylum Chloroflexi. We unraveled a remarkable genomic diversity of pelagic freshwater Chloroflexi representatives that thrive not only in the hypolimnion as previously suspected, but also in the epilimnion. Our results suggest that the lake hypolimnion provides a globally stable habitat reflected in lower species diversity among hypolimnion-specific CL500-11 and TK10 clusters in distantly related lakes compared to a higher species diversity of the epilimnion-specific SL56 cluster. Cell volume analyses show that the CL500-11 are among the largest prokaryotic cells in the water column of deep lakes and with a biomass to abundance ratio of two they significantly contribute to the deep lake carbon flow. Metabolic insights indicate participation of JG30-KF-CM66 representatives in the global cobalamin production via cobinamide to cobalamin salvage pathway. Extending phylogenomic comparisons to brackish and marine habitats suggests salinity as the major influencer of the community composition of the deep-dwelling Chloroflexi in marine (SAR202) and freshwater (CL500-11) habitats as both counterparts thrive in intermediate brackish salinity; however, freshwater habitats harbor the most phylogenetically diverse community of pelagic Chloroflexi representatives that reside both in epi- and hypolimnion. In recent years, a combination of improved cultivation techniques and the use of cultivation-free approaches has led to an increasingly detailed understanding of several groups of abundant and ubiquitous freshwater microbes, e.g., Actinobacteria [1–3], Betaproteobacteria [3–6], Alphaproteobacteria [3, 7–9], and Verrucomicrobia . However, there are still cases of several ubiquitous groups that have largely eluded extensive characterizations. One such important instance is the phylum Chloroflexi that has been shown to be abundant (up to 26% of total prokaryotic community) , but mostly in the hypolimnion of lakes. In particular, the CL500-11 lineage (class Anaerolineae) is a significant member in deeper waters. Originally described from Crater Lake (USA) (> 300 m depth) using 16S rRNA clone library and oligonucleotide probe hybridization [12, 13], these microbes have been found to constitute consistently large fractions of prokaryotic communities in deep lake hypolimnia all over the world [11–16]. The only genomic insights into their lifestyle come from a single metagenomic assembled genome (MAG) from Lake Michigan (estimated completeness 90%) along with in situ expression patterns that revealed CL500-11 to be flagellated, aerobic, photoheterotrophic bacteria, playing a major role in demineralization of nitrogen-rich dissolved organic matter in the hypolimnion . Another lineage is the CL500-9 cluster  that was described as a freshwater sister lineage of the marine SAR202 cluster (now class “Ca. Monstramaria”) , but since the original discovery, there have been no further reports of its presence in other freshwater environments. Apart from these, there are only sporadic reports (of 16S rRNA sequences) for pelagic Chloroflexi, with little accompanying ecological information (e.g., SL56 and TK10) [11, 15, 18–20]. 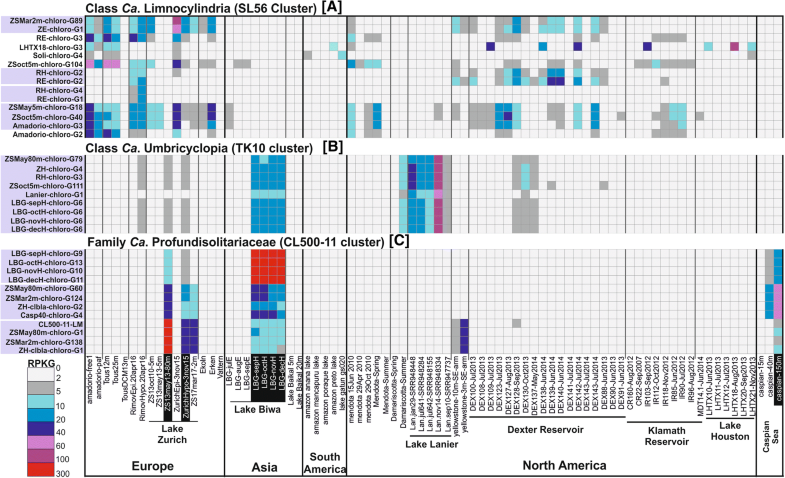 In this work, we attempt to provide a combined genomic perspective on the diversity and distribution of Chloroflexi from freshwater, brackish, and marine habitats. Using publicly available metagenomic data supplemented with additional sequencing from both epilimnion and hypolimnion at multiple sites, we describe three novel class-level groups of freshwater Chloroflexi, along with a diverse phylogenetic assortment of genomes dispersed virtually over the entire phylum. Our results also suggest that origins of pelagic Chloroflexi are likely from soil and sediment habitats and that their phylogenetic diversity at large correlates inversely to salinity, with freshwater habitats harboring the most diverse phylogenetic assemblages in comparison to brackish and marine habitats. 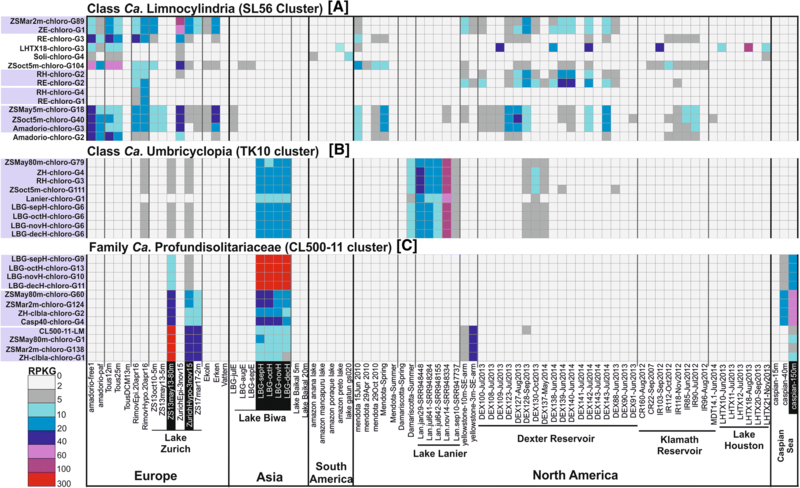 Based on 16S rRNA read abundances from 117 metagenomes from lakes, reservoirs, and rivers, representatives of the phylum Chloroflexi comprised up to 7% of the prokaryotic community in the epilimnion (Fig. 1a, b), however, with large fluctuations. Similar to previous observations [11–16], the CL500-11 lineage dominated hypolimnion samples (reaching at least 16% in all but one sample, and nearly 27% in one sample from Lake Biwa) (Fig. 1c), apart from a lesser-known group referred to as the TK10 cluster. The majority of TK10-related 16S rRNA sequences in the SILVA database  originate from the soil, human skin, or unknown metagenomic samples, while only four (1.5%) are from freshwaters (Additional file 1: Figure S1A). Surprisingly, the epilimnion samples were dominated by sequences affiliated to “SL56 marine group” (up to ca. 5% of total prokaryotic community). SL56-related sequences of SILVA have been recovered from a freshwater lake  and the Global Ocean Series datasets (GOS) . However, the GOS sample from which they were described is actually a freshwater dataset, Lake Gatun (Panama). It is quite evident from our results (Fig. 1; Additional file 1: Figure S2) that this cluster is consistently found only in lakes, reservoirs, and rivers but not in the marine habitat, suggesting it has been incorrectly referred to as a “marine group.” Another group of sequences, referred to as JG30-KF-CM66, described from diverse environments (uranium mining waste pile, soil, freshwater, marine water column, and sediment), was found to be preferentially distributed in rivers (particularly the River Amazon) than lakes (Fig. 1a, b), albeit at very low abundances (maximum 1% of total prokaryotes). Similar abundances were found in the brackish Caspian Sea (depths 40 m and 150 m) (Additional file 1: Figure S2). However, we could find no support for the presence of either the SAR202 cluster or its freshwater sister clade CL500-9 in all freshwater metagenomic datasets examined. In marine and brackish habitats, SAR202 are almost exclusively found in the dark aphotic layers, where they account for up to 30% of the prokaryotic community [24–26]. 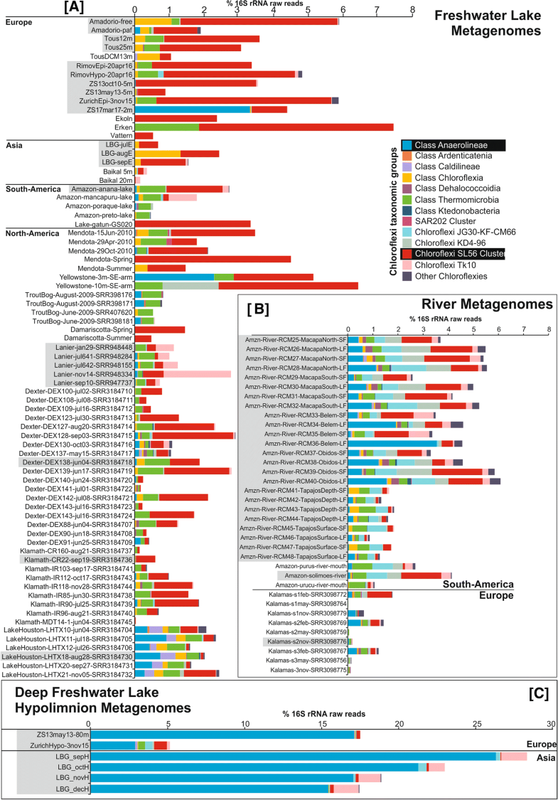 If there are any SAR202-related clades in freshwater habitats, they are certainly not very abundant or perhaps did not originate from the water column in the original report  (Additional file 1: Figure S1). Overall, even though relative abundances of Chloroflexi in the freshwater epilimnia are far lower than in the deeper waters, they are home to a rich and widespread collection of novel groups. With these observations, it is also readily apparent that in the aquatic environments examined here (freshwater, brackish, and marine), the diversity of Chloroflexi representatives is substantially different, with the freshwater environments harboring a phylogenetically more diverse assortment of groups than either the brackish or the marine. Moreover, there is clear evidence for the presence of freshwater only groups (e.g., SL56) and marine and brackish only groups (SAR202), reiterating that salinity is a barrier towards microbial habitat transitions between freshwater and marine ecosystems . It is by no means an insurmountable barrier as relatively recent transitions from freshwater to marine (e.g., the freshwater “Ca. Methylopumilus spp.” and marine OM43 [4, 28]) and in reverse (marine Pelagibacter and freshwater LD12 [29, 30]) have both been proposed. However, it is likely that the groups found in brackish environments may perhaps be simply better “primed” for more successful forays. We do find examples of groups that are present in freshwater and brackish metagenomes (JG30-KF-CM66 and CL500-11). Automated binning of Chloroflexi-related contigs from assemblies of each 57 datasets belonging to 14 different environments (28 lakes/reservoirs, 26 rivers, and 3 brackish datasets) resulted in segregation of 102 MAGs (metagenome-assembled genomes) in total (Additional file 2: Table S1). Phylogenomic analysis of MAGs with 30% or higher completeness (n = 53) shows that a remarkably high diversity of MAGs was recovered from practically all well-known Chloroflexi classes (Fig. 2). Thirty-five MAGs constituted three separate novel class-level lineages with no available cultured representatives (SL56, TK10, and JG30-KF-CM66). While fluorescence in situ hybridization followed by catalyzed reporter deposition (CARD-FISH) detected high numbers of the CL500-11 cells in Lake Zurich epilimnion during partial mixis in winter, peak abundance levels were always found in deeper zones, in both Lake Zurich (up to 11% of all prokaryotes; Fig. 3a) and Lake Biwa (up to 14%; Fig. 3d). CL500-11 abundance correlated negatively with both temperature and chlorophyll a concentration (Additional file 1: Figure S3). In Řimov Reservoir samples, however, CL500-11 was below the detection limit (< 0.18%), suggesting that this relatively shallow habitat (maximum depth 43 m) does not represent a preferred niche for this group of bacteria (Additional file 1: Figure S4). CL500-11 cells have been previously visualized by CARD-FISH and shown to be large, curved cells . Similar shapes and sizes were observed in FISH samples from Lake Zurich with mean lengths of 0.92 μm (range 0.4–1.6 μm; n = 277) and widths of 0.28 μm (range 0.19–0.39 μm). Analyzing the cell volumes (median 0.06 μm3) and biomass for this cluster in comparison to all prokaryotes (Fig. 3c) suggests an extremely high contribution of the CL500-11 population to total microbial biomass. Their biomass to abundance ratio is nearly 2, i.e., at 10% abundance they comprise almost 20% of the total prokaryotic biomass, indicating a remarkable adaptation to the relatively oligotrophic deep hypolimnion, attaining high populations even with their large cell sizes. We recovered 11 MAGs (10 freshwaters, 1 brackish) for CL500-11 in total. All four MAGs of Lake Biwa from different months form a single species. However, the two species from Lake Zurich appear to coexist throughout the year (March, May, and November) with one species branching together with the previously described MAG from Lake Michigan (CL500-11-LM)  and the other species having close representatives also in the brackish Caspian (> 95% ANI) and similar metagenomic fragment recruitment patterns (Figs. 2 and 4c). We propose the candidate genus Profundisolitarius (Pro.fun.di.so.li.ta’ri.us. L. adj. profundus deep; L. adj. solitarius alone; N.L. masc. n. Profundisolitarius a sole recluse from the deep) within Candidatus Profundisolitariaceae fam. nov. for the CL500-11 cluster (class Anaerolinea). On the other hand, the SL56 group is the dominant lineage in the Řimov Reservoir (maximum 1.1%), both by 16S rRNA and CARD-FISH analyses (Figs. 1 and 3). Maximal abundances were nearly always found at around 5–20 m at temperatures of ca. 15 °C, suggesting that this group is primarily epilimnetic (Additional file 1: Figures S3 and S4). This region of the water column (thermocline), apart from having a temperature gradient, also has significantly lower light intensity in comparison to surface layers. Peak abundances of the low-light adapted cyanobacterium Planktothrix rubescens  at around 13 m depth in the stratified summer profiles of Lake Zurich coincide with maximal abundances of the SL56 (Additional file 1: Figure S3). SL56 cells are rod-shaped and elongated (average length = 0.68 ± 0.25 μm; average width = 0.35 ± 0.09 μm; n = 6; Fig. 3e). To the best of our knowledge, this is the first report of a freshwater-specific Chloroflexi group that appears to thrive in the epilimnion. 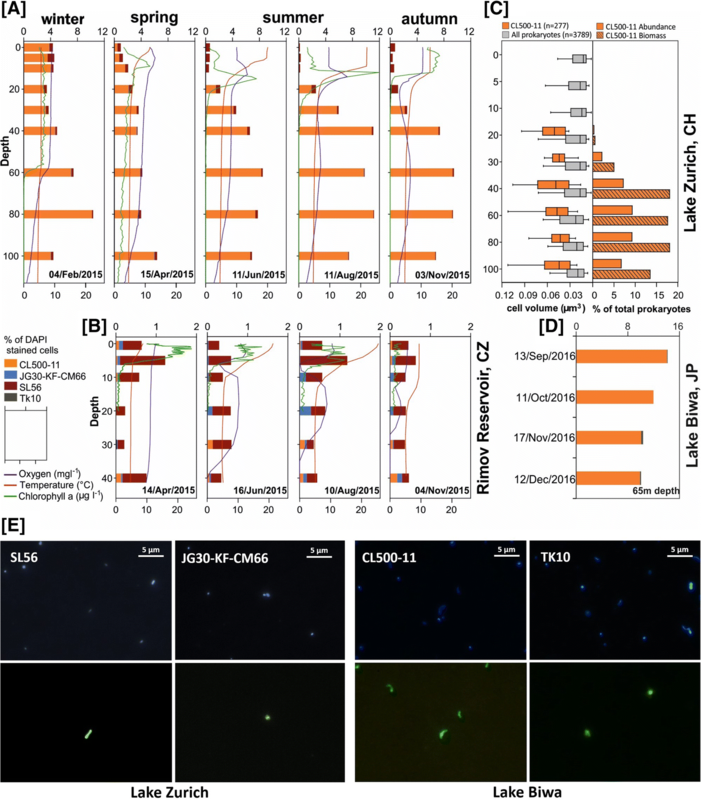 A total of 14 MAGs were recovered for SL56 cluster (1 containing 16S rRNA) and form a class-level lineage, considerably divergent from all known Chloroflexi (Fig. 2). Their sole relative is a single MAG (Chloroflexi CSP1-4) described from aquifer sediment . The 16S rRNA clade to which the CSP1-4 reportedly affiliates to is Gitt-GS-136 , and the majority of sequences in this clade originate from either soil or river sediments (information from SILVA taxonomy). However, we were unable to detect any 16S rRNA sequence (partial or complete) in the available genome sequence of CSP1-4. The next closest clade (in the 16S rRNA taxonomy) to Gitt-GS-136 and SL56 is KD4-96, whose sequences were obtained from the same habitats (see Additional file 1: Figure S1B). In addition, all known 16S rRNA sequences from the SL56 group originate only from freshwaters (Lake Gatun, Lake Zurich, etc.). Taken together, it appears that the closest phylogenetic relatives of the freshwater SL56 lineage inhabit soil or sediment habitats. SL56 MAGs were reconstructed from geographically distant locations (Europe, North and South America, Fig. 2), and at least nine different species could be detected (ANI, Fig. 1). No MAGs were obtained from Lake Biwa samples, but three 16S rRNA sequence were retrieved in unbinned contigs. The reconstructed MAGs are globally distributed along freshwater datasets from epilimnion (none detected in the deep hypolimnion) (Fig. 4 and Additional file 1: Figure S6). No SL56 MAGs were reconstructed from the Caspian Sea, and none of the recovered genomes recruited from brackish metagenomes. We propose the candidate genus Limnocylindrus (Lim.no.cy.lin’drus. Gr. fem. n. limne a lake; L. masc. n. cylindrus a cylinder; N.L. masc. n. Limnocylindrus a cylinder from a lake) within Limnocylindraceae fam. nov., Limnocylindrales ord. nov., and Limnocylindria classis. nov. for the Chloroflexi SL56 cluster. TK10 16S rRNA sequences were found at highest abundances in Lake Biwa hypolimnion samples (maximum ca. 2%) (Fig. 1a, c). Cells were ovoid with an estimated length of 1.08 ± 0.1 μm and width of 0.84 ± 0.09 μm (n = 12; Fig. 3e). A coherent cluster of nine MAGs (three containing 16S rRNA Additional file 1: Figure S1) from geographically distant locations (Europe, Asia, and North America) was recovered. These remarkably cosmopolitan organisms thriving in deeper lake strata are not very diverse (ANI values > 95%). This apparent low diversity might be a consequence of a very specialized niche or what is more likely, an outcome of a relatively recent transition to freshwater, similar to “Ca. Fonsibacter” (LD12 Alphaproteobacteria) . No 16S rRNA representatives were detected confidently in marine or brackish metagenomes though some 16S rRNA sequences of SILVA database have been obtained from marine sediments and water column (Additional file 1: Figure S1). Closest relatives from 16S rRNA appear to be either from soil or from sediment samples suggesting that these might be their original habitat. Interestingly, the TK10 cluster is also deep branching, only after SL56 and CSP1-4 in the phylogenetic tree of Chloroflexi at large, and all other Chloroflexi representatives (MAGs or isolate genomes) appear to be descended from a branch distinct to both of these. We suggest the candidate genus Umbricyclops (Um.bri.cy’clops. L. fem. N. umbra shadow; L. masc. n. cyclops (from Gr. Round eye; Cyclops) a cyclops; N.L. masc. n. Umbricyclops a round-eye living in the shade) within Umbricyclopaceae fam. nov., Umbricyclopales ord. nov., and Umbricyclopia classis nov. for this group of organisms. CARD-FISH results show that JG30-KF-CM66 cells are spherical with an estimated diameter of 0.56 μm (± 0.15 μm; n = 8; Fig. 3e); however, very low proportions (< 0.28%) were observed for JG30-KF-CM66 in Lake Zurich and the Řimov Reservoir depth profiles (Additional file 1: Figures S3 and S4). We obtained 12 MAGs, mostly from the deep water column (eight brackish, four freshwater), one with a near complete 16S sequence, that formed a novel class-level lineage in the phylogenomic analysis (Fig. 1). The closest relatives of these MAGs are marine SAR202 and Dehalococcoidea (Fig. 1 and Additional file 1: Figure S1). Within this cluster, distinct groups of brackish and freshwater MAGs can be distinguished. We suggest the candidate genus Bathosphaera (Ba.tho.sphae’ra. Gr. adj. bathos deep; L. fem. n. sphaera a sphere; N.L. fem. n. Bathosphaera a coccoid bacteria living in the deep) within Bathosphaeraceae fam. nov., Bathosphaerales ord. nov., and Bathosphaeria classis. nov. for the Chloroflexi JG30-KF-CM66 cluster. We also recovered MAGs in the classes Chloroflexia (four MAGs) and Caldilineae (two MAGs) (Fig. 1). Chloroflexia MAGs were related to mesophilic Oscillochloris trichoides DG-6 in sub-order Chloroflexineae (one MAG) and three other MAGs to Kouleothrix aurantiaca in the Kouleotrichaceae fam. nov. forming a new sub-order for which we propose the name Kouleothrichniae sub-order. nov. None of these MAGs show any significant fragment recruitment apart from their place of origin. An additional 14 MAGs from the Caspian affiliated to the SAR202 cluster which will not be further discussed here as they have already been described . Metabolic insights into the reconstructed Chloroflexi MAGs (completeness ≥ 30%) suggest a primarily heterotrophic life style which in some groups is boosted by light-driven energy generation via either rhodopsins (CL500-11, Chloroflexales, SL56, and TK10) or aerobic anoxygenic phototrophy (Chloroflexales). The MAGs of each cluster contain necessary genes for central carbohydrate metabolism including glycolysis, gluconeogenesis, and tricarboxylic acid cycle. Key genes for assimilatory sulfate reduction (3′-phosphoadenosine 5′-phosphosulfate (PAPS) synthase and sulfate adenylyltransferase) were absent in most MAGs suggesting the utilization of exogenous reduced sulfur compounds . Denitrification genes (nitrate reductase/nitrite oxidoreductase alpha and beta subunits and nitrite reductase) were found in TK10 MAGs, but the subsequent enzymes responsible for the production of molecular nitrogen were absent. In aquatic environments, Thaumarchaeota and Cyanobacteria are the main source of cobalamin and its corrinoid precursors for the large community of auxotrophs or those few capable of salvage [34, 35]. De novo synthesis of cobalamin has a high metabolic cost, and the Black Queen Hypothesis has been put forward as an explanation for reasons why only a few community members undertake its production [34, 36, 37]. None of the reconstructed Chloroflexi MAGs encode necessary genes for corrin ring biosynthesis from scratch, and high affinity cobalamin (BtuBFCD) or other suspected corrinoid (DET1174-DET1176)  transporters were also missing which may be a consequence of genome incompleteness or use of an undescribed transporter. However, not all these organisms seem to be auxotrophs as the MAGs of JG30-KF-CM66 cluster encode genes for cobinamide to cobalamin salvage pathway that utilizes imported corrinoids together with intermediates from the riboflavin biosynthesis pathway to synthesize cobalamin . ZH-chloro-G3 MAG contains an almost complete cobalamin salvage (only missing CobC) and riboflavin biosynthesis pathway (Additional file 3: Table S2). Flagellar assembly genes were present in several MAGs of CL500-11 and TK10 clusters (Fig. 1 and Additional file 3: Table S2). However, the L- and P-ring components that anchor flagella to the outer membrane were missing in all flagellated MAGs and reference Chloroflexi genomes (e.g., Thermomicrobium , Sphaerobacter ). In addition, MAGs and reference Chloroflexi genomes did not encode genes for LPS biosynthesis and no secretion systems, apart from Sec and Tat, were detected (type I–IV secretion systems that are anchored in the outer membrane are absent) (Additional file 3: Table S2). Taken together, the comparative genomics of available Chloroflexi genomes bolster inferences that while electron micrographs suggest two electron dense layers in most members of this phylum, Chloroflexi likely possess a single lipid membrane (monoderm) rather than two (diderms) . Rhodopsin-like sequences were recognized in 18 MAGs of this study from representatives of CL500-11, Chloroflexia, SL56, and TK10 that are phylogenetically closest to xanthorhodopsins (Additional file 1: Figure S8A and B), and are tuned to absorb green light similar to other freshwater and coastal rhodopsins [2, 23] (Additional file 1: Figure S8C). Several MAGs encode genes for carotenoid biosynthesis allowing the possibility of a carotenoid antenna that is the hallmark of xanthorhodopsins [42–44]. Of the residues involved with binding salinixanthin (the predominant carotenoid of Salinibacter ruber), we found a surprisingly high number conserved (10 identical out of 12 in at least one rhodopsin sequence) (Additional file 1: Figure S8D), suggesting that a carotenoid antenna may be bound, making at least some of these sequences bonafide xanthorhodopsins. Even representatives of CL500-11 and TK10 that are primarily found in the hypolimnion during stratification are capable of phototrophy; however, they can potentially access the photic zone during winter and early spring mixis. Apart from rhodopsin-based photoheterotrophy, we also retrieved MAGs of the class Chloroflexia encoding genes for photosystem type II reaction center proteins L and M (pufL and pufM), bacteriochlorophyll, and carotenoid biosynthesis. The pufM gene sequences cluster together with other Chloroflexi-related pufM sequences (Additional file 1: Figure S9). However, no evidence for carbon fixation, via either the 3-hydroxypropionate pathway or the Calvin–Benson cycle was found in any photosystem bearing MAG which might be a consequence of MAG incompleteness. It may also be that these are aerobic anoxygenic phototrophs that do not fix carbon, e.g., freshwater Gemmatimonadetes and Acidobacteria (both aerobic) . It is apparent from the phylogenomic analyses that the collection of representatives of the phylum Chloroflexi recovered in this work, along with the existing genome sequences from isolates and MAGs, offers only a partial sketch of the complex evolutionary history of the phylum at large. For example, the most divergent branches “Ca. Limnocylindria” (SL56 cluster) and “Ca. Umbricyclopia” (TK10 cluster) have practically no close kin apart from an aquifer sediment MAG (related to “Ca. Limnocylindria”). However, related 16S rRNA clones have been recovered from soil/sediments for both these groups, suggesting transitions to a pelagic lifestyle (Additional file 1: Figure S1B). Factoring the absence of related marine 16S rRNA sequences for these groups, in addition to their undetectability in marine metagenomic datasets also suggests an ancestry from soil/sediment rather than the saline environment. While the possibility of a marine origin cannot be formally excluded, the directionality of a transition from soil/sediment to freshwater water columns appears most likely. Moreover, given that “Ca. Limnocylindria” and “Ca. Umbricyclopia” diverge prior to the divergence of the classes Dehalococcoidea and marine SAR202 (class “Ca. Monstramaria”), which are the only ecologically relevant marine Chloroflexi known as yet (the former in marine sediments and the latter in deep ocean water column), it is likely that ancestral Chloroflexi originated in a soil/sediment habitat. The success of marine SAR202 in the deep oceans is remarkable; it is the most widely distributed, perhaps numerically most abundant Chloroflexi group on the planet. However, some 16S rRNA sequences from its closest relatives, Dehalococcoidea, have also been recovered from freshwater sediments, even though the vast majority appear to be from deep marine sediments (both anoxic habitats). In this study, we significantly expand our conceptions regarding the diversity of pelagic Chloroflexi and their possible origins from soil/sediment habitats. Similar evolutionary trajectories are beginning to be visible for other freshwater microbes, e.g., the closest relatives of freshwater Actinobacteria (“Ca. Nanopelagicales” ) being soil Actinobacteria or the transition of methylotrophic Betaproteobacteria (“Ca. Methylopumilus”) from sediments to the water column [4, 28]. As more and more prokaryotic groups are examined along with sediment and soil habitats, we will finally be able to reconstruct the sequence of events that have led to the complex mosaic of freshwater microbial communities as we see them today. Lake Zurich: Samples from this oligo-mesotrophic lake (Switzerland) were collected on October 13, 2010 (5 m depth), May 13, 2013 (5 m and 80 m depth), November 3, 2015 (5 m and 40–80 m depth), and March 17, 2017 (2 m depth). The sampling site is located at the deepest part (136 m) of Lake Zurich. Lake Biwa: Samples from this mesotrophic lake were collected at a pelagic station (35° 12′ 58″ N1 35° 59′ 55″ E; water depth = ca. 73 m) in 2016. Samples from the epilimnion (5 m depth) were taken on July 20, August 18, and September 27. Samples from the hypolimnion (65 m) were taken on September 13, October 11, November 17, and December 12. All water samples were sequentially pre-filtered through 20- and 5-μm pore-size filters, and the flow-through microbial community was concentrated on 0.22-μm filters (polycarbonate (PCTE) membrane filters, Sterlitech, USA, for Řimov and Zurich samples and polyethersulfone filter cartridges (Millipore Sterivex SVGP01050) for Lake Biwa samples). DNA extraction of Řimov Reservoir and Lake Zurich samples was performed using the standard phenol–chloroform protocol . For samples from Lake Biwa, DNA was extracted by PowerSoil DNA Isolation Kit (MoBio Laboratories, Carlsbad, CA, USA). Sequencing of the samples from the Řimov Reservoir (n = 2) and Lake Zurich (n = 2) was performed using Illumina HiSeq4000 (2 × 151 bp, BGI Genomics, Hong Kong, China), additional samples from Lake Zurich (n = 4) were sequenced using Illumina HiSeq2000 (2 × 150X bp, Functional Genomics Center, Zurich, Switzerland), and Lake Biwa samples (n = 7) were sequenced using MiSeq (2 × 300 bp, Bioengineering Lab. Co., Ltd. Kanagawa, Japan). Basic metadata (sampling date, latitude, longitude, depth, bioproject identifiers, SRA accessions) and sequence statistics (number of reads, read length, dataset size) of all metagenomes generated in this study are provided in Additional file 4: Table S3. A non-redundant version of the SILVA_128_SSURef_NR99 database  was created by clustering its 645,151 16S rRNA gene sequences into 7552 sequences at 85% nucleotide identity level using UCLUST . Ten million reads from each dataset were compared to this reduced set, and an e value cutoff of 1e−5 was used to identify candidate 16S rRNA gene sequences. If a dataset had less than 10 million reads, all reads from the dataset were used to identify candidate sequences. These candidate sequences were further examined using ssu-align, and segregated into archaeal, bacterial, and eukaryotic 16S/18S rRNA or non-16S rRNA gene sequences . The bona fide prokaryotic 16S rRNA sequences were compared to the complete SILVA database using BLASTN  and classified into a high level taxon if the sequence identity was ≥ 80% and the alignment length was ≥ 90 bp. Sequences failing these thresholds were discarded. The 16S rRNA reads belonging to the phylum Chloroflexi were furtherly segregated to lower taxonomic levels of the SILVA taxonomy. Assembled 16S rRNA sequences of the 120 assembled freshwater datasets were identified using Barrnap with default parameters (https://github.com/tseemann/barrnap). Genes encoding 16S rRNA were aligned using the SINA web aligner , imported to ARB  using the SILVA_128_SSURef_NR99 database , manually checked, and bootstrapped maximum likelihood trees (GTR-GAMMA model, 100 bootstraps) were calculated with RAxML . Řimov Reservoir was sampled four times in 2015, during the spring phytoplankton bloom (April 14), early summer (June 16), late summer (August 10), and autumn (November 04). Vertical profiles of physicochemical parameters were taken by a YSI multiprobe (Yellow Springs Instruments, model 6600, Yellow Springs, OH, USA), and profiles of different phytoplankton groups differentiated by their fluorescent spectra were obtained with a fluorescence probe (FluoroProbe, TS-16-12, bbe Moldaenke GmbH, Schwentinental, Germany). Water samples were taken from 0, 5, 10, 20, 30, and 40 m depths (n = 28). Lake Zurich was sampled five times in 2015, during winter mixis (February 4), the spring phytoplankton bloom (April 15), early summer (June 11), late summer (August 11), and autumn (November 03). Sampling included vertical profiles of physicochemical parameters using a YSI multiprobe (Yellow Springs Instruments, model 6600, Yellow Springs, OH, USA) and profiles of four phytoplankton groups (Planktothrix rubescens, green algae, diatoms, and cryptophytes) differentiated by different fluorescent spectra using a submersible fluorescence probe (FluoroProbe, TS-16-12, bbe Moldaenke GmbH, Schwentinental, Germany). Water samples for bacterial analyses were taken from 0, 5, 10, 20, 30, 40, 60, 80, and 100 m (n = 45). CARD-FISH samples from Lake Biwa were taken at the same time as the metagenomic samples. In the present study, only the hypolimnetic samples were analyzed (September, October, November, and December 2016 at 65 m depth). CARD-FISH (fluorescence in situ hybridization followed by catalyzed reporter deposition) with fluorescein-labeled tyramides was conducted as previously described  with a probe specific for the CL500-11 cluster of Chloroflexi  and three novel probes targeting the lineages SL56, JG30-KF-CM66, and TK10 (see Additional file 5: Table S4 for details). A total of 54 16S rRNA sequences from multiple groups of freshwater Chloroflexi (e.g., CL500-11, SL56, TK10, and JG30-KF-CM66, Additional file 1: Figure S1A) were extracted from MAGs (n = 7) or unbinned Chloroflexi contigs (n = 47). These additional sequences were used to supplement a local reference database for prokaryotes (see the “Methods” section) and design FISH probes for these groups. Probe design based on 16S rRNA genes was done in ARB . A bootstrapped maximum likelihood tree (GTR-GAMMA model) of 16S rDNA sequences (Additional file 1: Figure S1) served as backbone for probe design with the ARB tools probe_design and probe_check. The resulting probes with their corresponding competitor and helper oligonucleotides (Additional file 5: Table S4) were tested with different formamide concentrations to achieve stringent hybridization conditions. CARD-FISH-stained samples were analyzed by fully automated high-throughput microscopy . Images were analyzed with the freely available image analysis software ACMEtool 216 (technobiology.ch), and interfering autofluorescent cyanobacteria or debris particle were individually excluded from hybridized cells. At least 10 high quality images or >1000 DAPI-stained bacteria were analyzed per sample. Cell sizes of CARD-FISH-stained Chloroflexi CL500-11 and all prokaryotes were measured from one depth profile from Lake Zurich (November 3, 2015) with the software LUCIA (Laboratory Imaging Prague, Czech Republic) following a previously described workflow . At least 200 individual DAPI-stained cells (corresponding to 24-65 CL500-11 cells) per sample were subjected to image analysis. Total numbers of heterotrophic prokaryotes were determined by an inFlux V-GS 225 cell sorter (Becton Dickinson) equipped with a UV (355 nm) laser. Subsamples of 1 ml were stained with 4′,6-diamidino-2-phenylindole (DAPI; 1 μg ml−1 final concentration), and scatter plots of DAPI fluorescence vs. 90° light scatter were analyzed with an in-house software (J. Villiger, unpublished). Lake Biwa (seven datasets) and Lake Zurich (four datasets) were assembled using metaSPAdes (-k 21,33,55,77,99,127) . All other datasets, including those from the Řimov Reservoir, were assembled using megahit (--k-min 39 --k-max 99/ 151 --k-step 10 --min-count 2). A complete list of all metagenomic datasets assembled in this study (n = 57) is shown in Additional file 2: Table S1. Prior to assembly, all datasets were quality trimmed either using sickle (https://github.com/najoshi/sickle, default parameters), or for Lake Zurich and Lake Biwa metagenomes, Trimmomatic  was used to remove adaptor sequences, followed by 3′ end quality-trim using PRINSEQ  (quality threshold = 20; sliding window size = 6) (also indicated in the Additional file 4: Table S3). Prodigal (in metagenomic mode) was used for predicting protein-coding genes in the assembled contigs . All predicted proteins were compared to the NCBI-NR database using MMSeqs2 (e value 1e−3)  to ascertain taxonomic origins of assembled contigs. Only contigs longer than 5 kb were used for genome reconstructions. A contig was considered to belong to the phylum Chloroflexi if a majority of its genes gave best hits to this phylum. Chloroflexi-affiliated contigs within each dataset were grouped based on the tetra-nucleotide frequencies and contig coverage pattern in different metagenomes using MetaBAT with “superspecific” setting . Preliminary genome annotation for all bins was performed using Prokka . Additional functional gene annotation for all Chloroflexi bins was performed by comparisons against COG hmms  using and e value cutoff of 1e−5, and TIGRfams models  (using trusted score cutoffs --cut_tc) using the hmmer package . The assembled genomes were also annotated using the RAST server  and BlastKOALA . Enzyme EC numbers were predicted using PRIAM . CheckM  was used to estimate genome completeness. A reference phylogenomic tree was made by inserting complete genomes of representatives from all known Chloroflexi classes and reconstructed MAGs of this study (with estimated completeness of 30% and higher) to the built-in tree of life in PhyloPhlAN . PhyloPhlAN uses USEARCH  to identify the conserved proteins, and subsequent alignments against the built-in database are performed using MUSCLE . Finally, an approximate maximum likelihood tree is generated using FastTree  with local support values using Shimodaira–Hasegawa test . 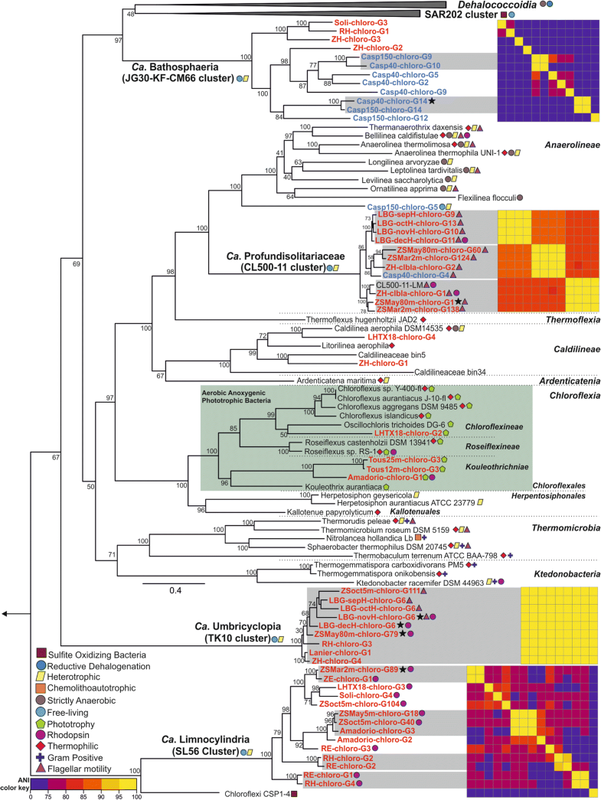 This analysis confirmed that all reconstructed MAGs belong to the phylum Chloroflexi and also suggests their phylogenetic affiliations within the phylum. To avoid bias in abundance estimations owing to the presence of highly related rRNA sequences in the genomes/metagenomes, rRNA sequences in all genomes were masked. After masking, recruitments were performed using BLASTN , and a hit was considered only when it was at least 50 bp long, had an identity of > 95%, and an e value of ≤ 1e−5. These cutoffs approximate species-level divergence . These hits were used to compute the RPKG (reads recruited per kilobase of genome per gigabase of metagenome) values that reflect abundances that are normalized and comparable across genomes and metagenomes of different sizes. The pufM and rhodopsin protein sequence alignments were performed using MUSCLE , and FastTree2  was used for creating the maximum likelihood tree (JTT+CAT model, gamma approximation, 100 bootstrap replicates). Average nucleotide identity (ANI) was calculated as defined in . The authors thank P. Znachor, P. Rychtecký, T. Shabarova, and J. Nedoma for help with sampling of the Římov Reservoir and E. Loher and T. Posch for help with sampling Lake Zurich. S. Neuenschwander is acknowledged for the help with the metagenomic library preparation of Lake Zurich. Aharon Oren is acknowledged for the taxa nomenclature review. M.M. was supported by the Czech Academy of Sciences (Postdoc program PPPLZ application number L200961651). R.G., A.S.A., and K.S. were supported by the research grants 17-04828S and 13-00243S from the Grant Agency of the Czech Republic. The collaborative work of M.M., Y.O., S.H.N., and K.S. was supported by JSPS Bilateral Joint Research Project No. JSPS-17-17. Y.O. and S.H.N. were supported by Environment Research and Technology Development Fund No 5-1607 of the Ministry of the Environment, Japan. Y.O. was also supported by JSPS KAKENHI Grant No 15 J00971 and by The Kyoto University Foundation. Computation time was partially provided by the Super Computer System, Institute for Chemical Research, Kyoto University. The metagenomic raw read files of the epilimnion and hypolimnion of Řimov Reservoir, Lake Zurich, and Lake Biwa are archived at the DDBJ/EMBL/GenBank and can be accessed under the Bioprojects PRJNA429141, PRJNA428721, and PRJDB6644 respectively. All assembled genomic bins of this study can be accessed under the Bioprojects PRJNA356693, PRJDB7436, and PRJNA449258. MM and RG conceived and designed the research. MM, YO, SHN, MMS, RG, and KS were involved in the sampling, sample processing, and filtration. MM, MMS, YO, ASA, and RG performed the metagenomic data analyses. MMS and YO performed the CARD-FISH analyses. MM, MMS, and RG wrote the manuscript with input from all authors. All authors read and approved the final text. Ethics approval was not required for the study. Han M, Gong Y, Zhou C, Zhang J, Wang Z, Ning K. Comparison and interpretation of taxonomical structure of bacterial communities in two types of lakes on Yun-Gui plateau of China. Nat Publ Gr. 2016. https://doi.org/10.1038/srep30616.